In the fall of 2016 Housing Options began a strategic planning process. This involved an extensive analysis of the services we provide, our role in the community and the surrounding area. As a result of this analysis we concluded that while our services are strong the name Housing Options has often led to confusion. In order to better represent the services we provide and individuals we serve our agency began a rebranding process. The goal of our rebranding was not to abandon our past under Housing Options but rather to take our success under our former name and expand it further. Housing Options for the Mentally Ill in Evanston Inc. was founded in 1988 by concerned citizens who wanted there to be more available and affordable housing in the Evanston area. The agency's first logo demonstrated the focus of the agency at the time: housing. Housing Options began to add onto the Housing Program over the years. First by bringing clinical services in house and then adding an Employment Services program as well. The second Housing Options logo shows the agency's focus on holistic care and empowerment. While Housing Options transitioned to Impact in 2017, its core mission remains the same. The name Impact is about better representing what we do and who we serve. The truth is that our services aren't the same for each person that receives them, they are individualized and customizable; however, they always make an impact. When Impact began as Housing Options the primary focus of our agency was providing housing for individuals with mental illness in the Evanston area. Since then, our agency has grown and so have the services that we provide. Now Impact has robust Housing, Clinical and Employment Services programs that allow our agency to serve over 150 individuals. As a Housing First modeled agency, housing is still a central and important part of the services that we provide. At Impact we believe that housing is the first step in recovery, for this reason we always work to ensure that our participants have a stable, safe place to live. While Impact remains committed to the Evanston area and serving more individuals in Evanston, we have also began serving those in other geographical areas that may not have access to the services Impact provides. Impact partners with other mental health agencies to provide services that their clients would otherwise not have access to. Currently Impact is partnering with the Josselyn Center, Turning Point, and Leyden Family Services. These partnerships have allowed us to serve new geographical areas and individuals. Impact's strategic plan involves more extensive partnerships and expansion in the Northshore. Times change and while Housing Options for the Mentally Ill in Evanston Inc. was appropriate at the time we were founded, there are new and better ways to refer to the individuals that we serve. At Impact we work with the individuals we serve to develop treatment plans and set goals that are personalized and attainable. 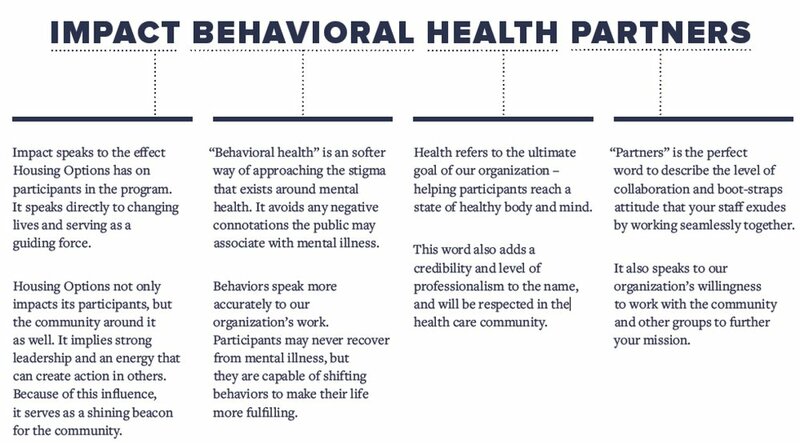 We replaced "for the Mentally Ill" in our former title with "Behavioral Health Partners" because the people we serve are so much more than their diagnoses; they are daughters, sons, friends, artists, accountants and members of the community.